Action Memo is one of the features entrenched in the new Samsung Galaxy Note 4 device. It is specifically designed to let you write memos quickly and directly link actions to them. The Action Memo can be accessed from any Home screen of the Galaxy Note 4 and then make calls, send messages, search the web and do more things with this feature. 1. Get your phone ready and remove the S Pen from the slot. Generally, the Air Command features of Note 4 will launch when you remove the S Pen from the slot. Although this may vary depending on the S Pen detachment option setting configuration. If you want to change the S Pen detachment option setting, just go to Settings, tap on S Pen and then select Detachment options. 2. Now hold it a few millimeters above the screen and then press the S Pen to show the Air Command Menu. 3. Next, tap on the Action Memo icon. 4. Tap on the Close (x)icon next to Link memos to actions. 5. 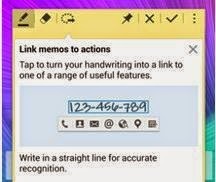 Write anything in the Memo pad on the screen using the S Pen. To make this example more specific, we'll write a contact number. 6. Tap on the Link to action icon (third icon from the left) once you're done creating the memo. 7. You will then be prompted with a menu bar with Action. Use the S Pen if you want to draw around a specific part of the memo you want to use. 8. Tap on the icon for the Action item you want to use. 9. The contact number you've written in the memo will now display in the Dialer app. You then can use that number to make a call using the dial icon or add that number to contacts using the + icon. Once the action memo is created, it will be shown as an icon. When you tap on that icon, you will be prompted with the Action Memo again. To save the Action Memo you've created, tap on the check mark (second icon on the upper right corner). Just follow the same steps if you want to try creating a new different action memo you want. And that would be all for this guide. More tutorials on Galaxy Note 4 will be available in this site soon, so please keep posted.